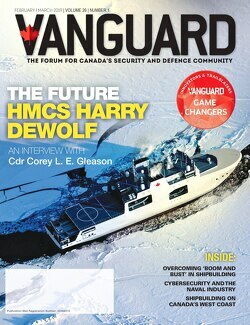 From the humblest of beginnings, DEFSEC Atlantic has grown to become the second-largest defence event in Canada that is held annually in Halifax, Nova Scotia. DEFSEC Atlantic is produced by the Nova Scotia International Air Show Association (NSIASA), which was established in 1996 as a not-for-profit society. Now in its 12th year, DEFSEC has evolved into an event that is “flexible, open and relevant to the industry” in serving the needs of all its participants. Leading this charge and at the helm of this organization is Colin Stephenson, the Executive Director of DEFSEC Atlantic who has played an integral role over the years in the success of this tradeshow. Due to his leadership role in DEFSEC, Vanguard has selected Stephenson as a Game Changer in the industry. I was running sales and operations for a company that sponsored the Air Show at Shearwater, Nova Scotia. A family friend was retiring and suggested that I would enjoy the opportunity. As part of the Air Show was a trade event focused on the Maritime Helicopter Replacement Project, Canada’s Sea Kings were being replaced. My new position had me in the thick of the competition at its height. Hangers full of industry displays and VIP tents full of executives as well as military procurement staff and the Canadian Forces crews; and future operators of the competition’s winner. After such an exciting introduction to the industry, we found ourselves without a theme or purpose as the MHP competition closed. We were faced with losing a major financial driver of the Air Show’s success. Simultaneously we had lost 12 Wing Shearwater as our home base and had to move the Air Show to an international airport in the same year we moved DEFSEC Atlantic into downtown Halifax. An uphill battle that few expected us to survive. What is your role in the organization today? My task was to reinvigorate the trade event as a three service industry event and create a networking opportunity for Atlantic Canadian businesses so that they might find partnerships with OEMs in the various procurements we knew of in the Canadian Forces. All at once we were creating themes on Fixed-Wing SAR, Unmanned Systems, Canada’s Arctic opportunities and a variety of Army vehicles and security needs. We learned quickly that the needs of the participants had to drive every decision we would make. By listening to them and fulfilling their desires, we created a thriving 1200 person networking space and partnership opportunity that continues to change with the procurement landscape and the needs of the A&D Community. As the Executive Director, I marshal the skills of a tiny but talented staff and a great group of volunteers who are committed to delivering a professional event that has the feel of an Atlantic Canadian kitchen party. While we had to shoot some pigeons in a converted waterfront warehouse one year, that was not my worst moment. I was challenged in my first year as Director by a sponsor who had paid for exposure and profile but felt they had not received what they paid for. We had failed to deliver, and he let me know with sincerity that they were disappointed. Well, the same experience that I’ve just related about the failure to deliver really made an impact and drove me to commit myself to delivering or, over-delivering on every partnership in the future. This serves as my aha moment as I learned; it is not a lightning bolt of inspiration that saves the day. It is determination and attention to the project and knowing that “luck” is the moment when preparation meets opportunity. Step back and analyse your journey, what is the takeaway you want to give to our audience? We know in Atlantic Canada that we must know who we are, and who we are not. We must discover our strengths and take advantage of our natural advantages. We must compete globally while remaining grounded in the character of our place. We can survive and thrive, not by trying to be a mirror or poor imitation of something else, but by being our best selves. I am most excited by the opportunity that is represented in the new Atlantic Canadian Aerospace and Defence Association. To have our region’s industry voice channelled through a well-structured organization that focuses on the supply chain opportunities of our SMEs is the best way to create success for all of our region. DEFSEC is the place where it is annually focused but, it happens all year and in all places. The Association will the glue that holds us together; even on choppy seas. How is your organization changing the game within your industry today? DEFSEC is a game changer in that it brings the larger defence companies to the region in an efficient way; it gathers the potential partners and creates an exchange opportunity. The growth has come from an open door policy that has seen an international audience recognize DEFSEC as an entry point to the Canadian Market and spawned export opportunities for our Canadian participants. While DEFSEC is not an innovation organization; it is a listening and delivering organization. We create a space where partners can come together and succeed. Fulfilling ITB obligations, sourcing supply chain needs and finding out where one fits in the challenging environment of Defence acquisitions; that’s the job of government facilitators at all levels and the companies they serve. Exploiting opportunity is the job of the participants and we must give them the setting to do it. What technologies, business models, and trends will drive the biggest change in your industry over the next two years? Keeping pace with the evolution of the procurement world and creating educational opportunities for our attendees in our program is the race we must run. The DEFSEC team is supported by a great steering group from industry and government who keep us informed so we can provide an environment for success. I will strive to be the good listener who can deliver on promises of exposure and profile.